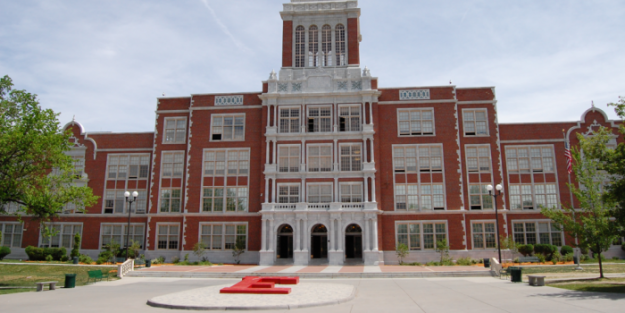 Denver’s East High School will be the site of a Colorado Supreme Court oral argument in an avalanche death lawsuit on Sept. 29 (DPS photo). The Colorado Supreme Court will go back to school this month to decide a case with potentially far-reaching implications for the state’s $3 billion-a-year ski industry. Part of the Colorado Judicial Branch’s “Courts in the Community” program, justices will consider oral arguments at Denver’s East High School on Sept. 29 in a lawsuit filed by the widow of a skier killed in an inbounds avalanche at Winter Park on Jan. 22, 2012. The Supreme Court will try to interpret the meaning of the term “inherent risks and dangers of skiing” as defined by the Colorado Ski Safety Act of 1979, which the state legislature passed to absolve ski resorts from legal liability resulting from conditions beyond their control. The central question of the Fleury versus Intrawest case is whether an avalanche inside a ski area’s boundary is one of those inherent risks and dangers or whether skiers and snowboarders have a reasonable expectation that resort operators will prevent avalanches within ski area boundaries or close off inbounds terrain where slides can occur. A separate lawsuit stemming from the death of a teenager that same day in another inbounds avalanche at Vail is on hold pending the Fleury decision – a case being closely watched by skiers, ski industry experts and officials for the U.S. Forest Service, which owns most of the land where Colorado ski resorts operate. While incredibly rare (just three inbounds avalanche fatalities in the state in the last 40 years), state lawmakers may have to take up the issue and amend the Ski Safety Act depending on the high court’s ruling. Asked if a decision in favor of Fleury would have a chilling effect on the ski industry, with resorts forced to rope off more inbounds terrain and close backcountry access gates, a Forest Service official told The Colorado Statesman he could not comment on the specifics of either lawsuit. “All I’ll say is that the Colorado Ski Safety Act is in the hands of the state legislature, so any changes would have to be initiated at that level,” said Don Dressler, Mountain Resort Program Manager for the U.S. Forest Service Rocky Mountain Region, based in Lakewood. Jim Heckbert, attorney for Salyndra Fleury, whose husband Christopher Norris died at Winter Park, argues that an inbounds avalanche is not on the state’s list of inherent risks and that ski areas are negligent if they don’t close or conduct avalanche-prevention work on inbounds trails. “If the Supreme Court rules in my client’s favor and says that an avalanche on an open trail in a developed ski area is not an inherent risk, the legislature certainly can go in there and change that,” Heckbert said, adding that Montana law does state that avalanches are an inherent risk, except on open trails within ski-area boundaries. Dressler said that education is the top priority for the Forest Service, especially on the topic of increasingly popular backcountry snow riding, where there is no avalanche control and ski patrol is not obligated to respond, even if skiers or snowboarders used resort lifts to access the area. As for access to more rugged or “extreme” terrain within ski area boundaries, such as cliff bands, steep chutes or tree islands between trails, Dressler said the Forest Service works with resorts to craft operating plans that make sense on an individual basis. “The internal boundary is really what we’re talking about here, and without having any kind of judge’s decision in hand, we will work with our resort operators to develop operating plans that make sense and education that keeps skiers knowledgeable of the risks,” Dressler said. Asked if a Supreme Court decision in his favor will force resorts to close off more inbounds extreme terrain and perhaps even backcountry gates, Heckbert, who’s also the attorney of record in the pending Vail case, said he thought a favorable ruling would result in greater clarity. “If somebody wants to go and take their chances on an open trail that is known to the ski area to be an avalanche chute, that’s OK, as long as the ski area tells you that and there’s a sign,” said Heckbert, who argues his clients were not fully informed of the risks that day in 2012. Intrawest attorney Peter Rietz did not return a call seeking comment. Colorado Judicial Branch spokesman Rob McCallum said the nearly 30-year-old Courts in the Community program features two Supreme Court and two appellate court sessions in high schools across the state each year, with students, teachers and other local officials allowed to ask questions after lawyers make their oral arguments and the justices deliberate. Also being argued Sept. 29 is the People versus Eduardo Perez, an identity theft case in which a lower court found Perez guilty of obtaining employment using a woman’s social security number. Perez argued prosecutors did not prove he knew the number belonged to the woman and that he had therefore stolen her identity, and the Court of Appeals agreed with him. Decisions in both cases won’t be rendered until a later date.